(Nanowerk News) People with type I diabetes must prick their fingers several times a day to test their blood sugar level. Though the pain is minor, the chore interferes with daily life. “They never really escape it,” says Paul Barone, a postdoctoral researcher in MIT’s Department of Chemical Engineering. Barone and professor Michael Strano are working on a new type of blood glucose monitor that could not only eliminate the need for finger pricks but also offer more accurate readings. Strano and Barone’s sensing system consists of a “tattoo” of nanoparticles designed to detect glucose, injected below the skin. A device similar to a wristwatch would be worn over the tattoo, displaying the patient’s glucose levels. A 2008 study in the New England Journal of Medicine showed that continuous monitoring helped adult type I diabetes patients who were at least 25 years old better control their blood glucose levels. However, existing wearable devices are not as accurate as the finger-prick test and have to be recalibrated once or twice a day — a process that still involves pricking the finger. Most existing continuous glucose sensors work via an injection of an enzyme called glucose oxidase, which breaks down glucose. An electrode placed on the skin interacts with a by-product of that reaction, hydrogen peroxide, allowing glucose levels to be indirectly measured. However, none of those sensors have been approved for use longer than seven days at a time. Bruce Buckingham, a professor of pediatric endocrinology at the Stanford School of Medicine and an author of the NEJM study, says glucose monitoring is definitely headed toward wearable sensors. However, he expects it will be a few years before any are approved for use without backup monitoring with a finger prick test. “As time goes on, the devices to do this should become smaller, easier to wear, and more accurate,” says Buckingham, who is not involved in the MIT project. The technology behind the MIT sensor, described in a December 2009 issue of ACS Nano ("Modulation of Single-Walled Carbon Nanotube Photoluminescence by Hydrogel Swelling"), is fundamentally different from existing sensors, says Strano. The sensor is based on carbon nanotubes wrapped in a polymer that is sensitive to glucose concentrations. When this sensor encounters glucose, the nanotubes fluoresce, which can be detected by shining near-infrared light on them. Measuring the amount of fluorescence reveals the concentration of glucose. The researchers plan to create an “ink” of these nanoparticles suspended in a saline solution that could be injected under the skin like a tattoo. The “tattoo” would last for a specified length of time, probably six months, before needing to be refreshed. 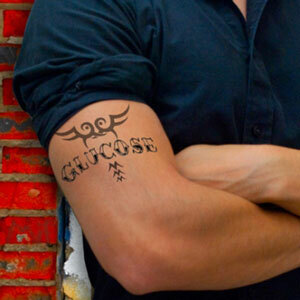 To get glucose readings, the patient would wear a monitor that shines near-infrared light on the tattoo and detects the resulting fluorescence. One advantage of this type of sensor is that, unlike some fluorescent molecules, carbon nanotubes aren’t destroyed by light exposure. “You can shine the light as long as you want, and the intensity won’t change,” says Barone. Because of this, the sensor can give continuous readings. Development of the nanoparticles and the wearable monitor is being funded by MIT’s Deshpande Center for Technological Innovation. Barone and Strano are now working to improve the accuracy of their sensor. Any glucose monitor must pass a test known as the Clarke Error Grid, the gold standard for glucose-sensor accuracy. The test, which compares sensor results to results from a lab-based glucose meter, needs to be very stringent, since mistakes in glucose detection can be fatal. They are still years away from human trials, says Barone, but they may soon start trials in animals. Those tests will be key to determining the value of this approach, says Buckingham. “You don’t know how good it will be until you put it in someone and see how strong the signal is,” he says.